It doesn’t take an IT mastermind to tell whether or not one’s web browser is hijacked. The symptoms are basically the same across different operating systems as well as browsers: the start page suddenly brings up a site that the user never chose to commence their web sessions from; also, all search queries, regardless of the engine used, get redirected to an odd-looking resource or a page designed to resemble some reputable and widely recognizable search service. This plot accurately applies to The Smart Search adware’s activity. Interestingly, there is a transit homepage involved in this campaign, namely search-quick.com, so this infection is obviously a compound one. Any website or search you attempt to go to from that page will be diverted to thesmartsearch.net. Not too many Mac users realize they are going to catch this malware when installing some free app or deploying an update from unverified resource. This kind of bundling is the technique mostly widely used to serve adware. The affiliated tools, mainly primitive browser extensions and media apps, already have the “optional” malicious extra hard-coded into their setup structure, and sometimes this option cannot be deactivated. Most of the time, though, users simply overlook the trick and fail to deselect that little checkmark. The adverse extension thus instantly appears on the add-on list for web browsers installed on the Mac machine, including Safari, Mozilla Firefox and Google Chrome. The custom settings henceforth become crooked and point to a website imposed by the adware. Again, when the browser is launched, what happens is it opens search-quick.com first instead of your preferred start page. That site itself looks like a simplistic search service with some ad banners, a funny image and the search box proper. Any random keyword lookup end you up on thesmartsearch.net. This way, the con individuals make sure their own Internet resources never fall short of web traffic, which is easily convertible into financial gain. Read the follow the instructions below to fix the problem of The Smart Search and search-quick.com contorting browser preferences on Mac OS X. When confronted with malicious code like the The Smart Search on Mac, you can neutralize its toxic impact by leveraging a specially crafted system utility. The Freshmac application (read review) is a perfect match for this purpose as it delivers essential security features along with must-have modules for Mac optimization. This tool cleans unneeded applications and persistent malware in one click. It also protects your privacy by eliminating tracking cookies, frees up disk space, and manages startup apps to decrease boot time. On top of that, it boasts 24/7 tech support. 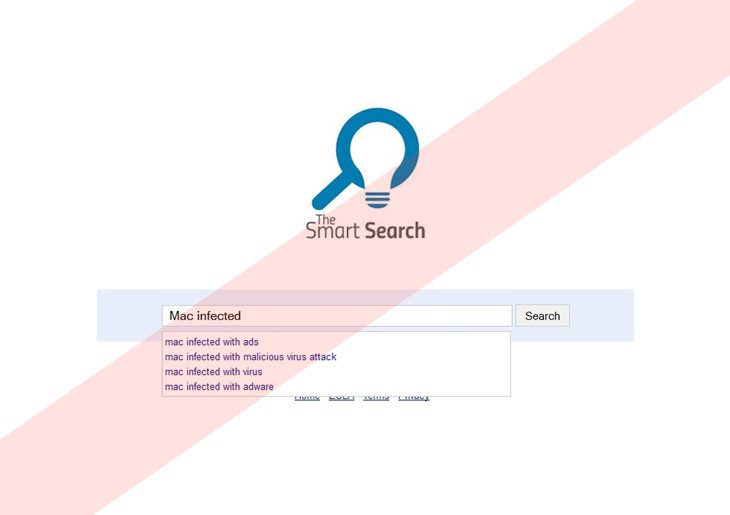 The following steps will walk you through automatic removal of the The Smart Search infection. 4. Check whether the Thesmartsearch.net virus has been fixed. If the lock screen is still there, go to the Uninstaller option on Freshmac GUI. Locate an entry that appears suspicious, select it and click Fix Safely button to force-uninstall the unwanted application. 5. Go to Temp and Startup Apps panes on the interface and have all redundant or suspicious items eliminated as well. The Thesmartsearch.net fraud shouldn’t be causing any further trouble.